Kelly T.M. Kilmer is a book artist and instructor living in Southern California. 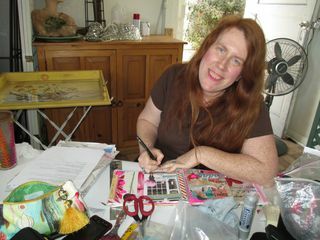 Kelly has been teaching mixed media workshops (both in person as well as online) for twenty years. Kelly believes that there is an artist in each and every one of us. Kelly's classes are designed specifically to bring that artist out. When not teaching or making art, Kelly also enjoys watching films, going for walks and trees.